You probably have heard that eight hours is the optimal amount of sleep in order to be well-rested, productive, and alert the next day. A recent Gallup poll found 45% of employed adults believe they don’t get enough sleep, many only averaging 6.8 hours a night. 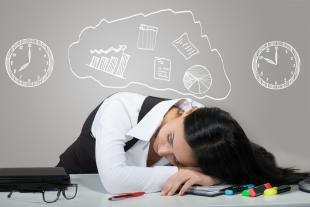 Sleep deprivation can affect your motivation, focus, and overall work ethic. A lack of sleep affects your productivity, can disrupt your relationships with coworkers, affects your ability to finish projects or simple tasks, and can cause problems in the workplace. Do you have that one coworker who consistently has bags under their eyes and drinks a little too much coffee, yet always likes to brag about getting only four hours of sleep every night? As if to say, “Look at how much I’m getting done with zero down time to rest my body. Can you beat that?” “It’s trendy not to sleep,” says Shelby Harris, Psy.D. “It’s better to be productive and go, go, go. The thing I hear all the time is, ‘I’ll sleep when I’m dead.”’ Overworking can significantly affect sleep. Being “productive” and not sleeping may work for one-off project requiring a single all-nighter. Being productive in that manner all the time, however, can create an unhealthy cycle not worthy of being bragged about. Sleep shouldn’t be a competition in the workplace, especially when a lack of it can hinder your work community as a whole. A lack of sleep can really affect your health and can become dangerous. A lack of sleep can seriously impact your stress level, leading to digestive issues, obesity, heart problems, depression, and many other health issues. In fact, 90% of those who lack sleep often suffer from another medical condition. You’ll miss out on something fun when you have to use your paid time off to recover from stress-related conditions. Putting your work down to get some extra hours of sleep is not going to kill you, but a heart attack might! Memory: You could forget to email that report due at noon, or to attend that conference call with a client. No sleep can cause your brain to become foggy, forgetting everything from important meetings to a set of numbers. Attention and Concentration: You can easily become unproductive once you get distracted. Taking away sleep, however, adds to the mind drifting. Getting your work done over a sustained amount of time can become extremely difficult when you lack focus necessary to complete tasks. Drink Coffee…But Not Too Much. It’s okay to take in the extra caffeine when necessary, but don’t overdo it. Too much will affect your sleep later on that evening, adding to the endless cycle of sleeplessness. To stay on the safe side, don’t go over four cups of coffee a day, and stop drinking caffeine at least six hours before bed. Cat Nap! A 15-20 minute snooze in your office can help give you new energy to finish out your day. If you don’t have your own office (because napping in a cubicle may not be the best idea) take an alternative route and go on a quick walk instead. Not only will sunlight be good for you and help to wake you up, but it can really spark some creativity! Create A Sleep Routine. Completing a sleep ritual is like completing any task at work. There are several steps you must accomplish in order to get to your main goal, which in this case, is getting your head on a pillow. A ritual can be anything from brushing your teeth to reading a chapter of a book to packing your gym bag or preparing your lunch for the next day. Anything that can help you get relaxed will be beneficial, but television before bed is never a good idea! If your body starts to tell you that you’re tired, listen to it! Just as it is important to properly nourish your body everyday, it is also important to make sure it is well rested. Without sleep, working a 9-5, or even focusing on the tiniest things throughout your day can become much more difficult. Try investing in new sleeping habits if you feel you are lacking some serious shut eye, especially if it is beginning to affect your work productivity, relationships in the office, and decision making. OpenSesame offers some great resources on the topic of sleep and how it affects your work!